I've always been an avid reader and for most of my life it was always a dream that one day I would be part of a book club. The mere thought of a book club conjured up an image of well bred ladies gathering every month to dissect and discuss a literary great over a cup of tea and perhaps some scones. Book club always had an air of the Bronte Sisters whenever I thought about it. Unfortunately it wasn't going to be a reality for me until I reached my early 40's. You see, book clubs are quite difficult to break into. Think of the cliquiest group at school and trying to penetrate their inner circle. Not. Going. To. Happen. It was like that for me with book clubs. Whenever I heard someone talking about "their" book club, my ears would prick up and I would suddenly be filled with questions and they had my unwavering attention, complete with lean in and constant staring. I almost became stalkerish in my interest. Looking back, it is no wonder I was never asked to join. In 2008 that all changed. I was finally asked to join a book club in my suburb. Me. Yes that's right. I'd finally made it into the book club elitists. I was there. I was one of them. No longer an outsider. I belonged to a book club. Me. You would think with my desire to join a book club that I would have known what to expect verbatim. Not so. I was very fond of living in a fantasy world in my head, so all my worldly knowledge of book clubs was either a figment of my wild imagination or something I had read about in a book. I did know that everyone is meant to buy the same book, read it over the month and then when we meet, we critique the book. I also knew that some members would not have read the book in the due time and would have to "bluff" their way through. Deep down I knew I'd be one of those women. If I was to be truly honest it was really the "thought of being in a book club" that appealed to me more than anything. I felt it would give me official "book loving" status. I did have nerves about reading a book I didn't like and having to critique it. In fact I was rather worried about this aspect. For my first book club appearance I wasn't required to bring a book, nor to have read a book. So far, so good. I felt quite happy that I was just going to sit and observe. This was a bonus. When I arrived I met the loveliest group of women who were all standing around a huge table covered entirely by books. There were over a hundred books on this table. My eyes widened and I was as excited as a bookworm in a bookshop. In fact I was so excited I didn't pay any attention during introductions and it was about 3 months before I knew everyone's name. The shame. Oh, the books. 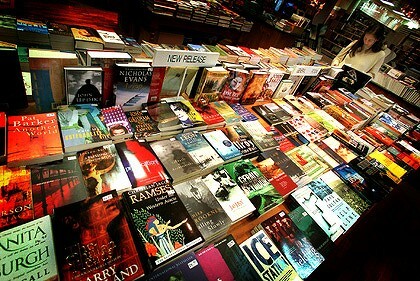 You are probably wondering why there were so many books on a table? Me too. This book club is not your everyday, run of the mill, Bronte sisters book club. This book club is "MY" type of book club. This is how it works. Every month book club is held at a different home. The host is also responsible for providing wine & nibblies (not tea and scones) booyeah! Members mill around the "library" table on arrival and discuss/choose books for around 30 minutes. There is no limit on the number of books you take. Members go home feeling rejuvenated, slightly tipsy and with 3 new books to read over the next month. Awesome right? Absolutely. Each member has different tastes in books and we all take the opportunity to buy books we might not normally buy. It has definitely broadened the range of books I like to read. The best part is that the person who buys the books ultimately gets to keep them. We write our names inside the cover and whenever we leave the book club (as if you would) or everyone has read them we take them home for our own book shelf. I have been in the book club for 3 years now and have 12 new books that I haven't yet read. It is the best. So, are you in a book club? Do you love it? Tell me, do you spend more time talking about "girl stuff" or the actual books? This blog post is dedicated to my lovely Twitter friend @easynowtiger who wanted to know a bit more about my book club. If you don't follow him on Twitter you so should. He's ace. Your Book Club sounds great! Like you, I have always wanted to be part of a Book Club. I love reading. In fact my favourite part of the weekend is laying in my hammock for an hour with my current book while the kids are "resting". I guess I will have to open my ears a bit more and hopefully I will hear of a book club like yours on my side of the mountain. I've always wanted to be part of a book club too but I've never found any in my area. I think your book club sounds awesome! Twice now I have attempted to join a book club and twice now I have failed. The first club had a fab group with the WORST taste in books. The second I liked the book choices but was irked by the people. That's my type of club ... love it! That book club sounds bloody awesome!!! I'm all for getting together, getting tipsy and talking a great amount of shite. I would LOVE to be a member of that club. That is exactly the problem I have with them is that it isn't necessarily books I would choose to read. And yes I know that's the point, but when you've spent ten years teaching books from a prescribed curriculum, you understand my break for freedom as well! Isn't it a great idea to take home new books and differet books...not just everybody buying the same books and reading them! I wonder who thought of that? What great ideas. I couldn't find a local bookclub so I set one up amongst my friends and co-workers last August. There are 10 of us but only about 5 people turn up, regularly. Out of those 5 only 2 people read the prescribed book within the time frame. Me being one of them which I find a little annoying but I do understand. I will definately be taking your ideas along with me to my book group. As we are looking for ways of making it more accessible. We seem to be a social group and I was worried that the reading was becoming secondary. To build a library, I'm sure we can all start with books from our homes. We often discuss books from a couple of months back as the slower readers complete them. So general book discussion will not be a problem. Thanks Annie, to be honest, I've nearly jacked the whole thing in a couple of times. You have given me hope and inspired me. I'm guessing that each book group will find it's own level of comfort. I will not loose hope. Hi again Annie, just one question. How do you avoid giving plot spoilers when discussing books that others haven't read? For instance 2 of us in my group wanted to discuss, 'So much for that' by Lionel Shriver, but we found it virtually impossible as others were planning on reading it. LJM - we don't discuss one book as a whole group. We tend to have discussions at the "book table" when we are selecting books. Sometimes we will have an in depth discussion about a book - and that will inspire someone else to read it. We don't really dissect books as such so tend to keep any spoilers out of conversation. Particularly if there is a twist & we know some people haven't read it. Have also been asked a couple of questions on Twitter about how we started - as in how did we have enough books for everyone at the beginning? Each person in the club brought along 4 or 5 books from their home bookshelf - that way we all got to read books we may not have read right from the beginning. That's really interesting food for thought. I do like the way that a one book theme involves everybody though. I have learnt some wonderful things that others have picked up and I've missed from texts or that they have researched. Our group tends to start with general conversations wine and nibbles,then, at some point in the middle we will discuss the set book in a random sort of way. Conversation tends to drift back to general discussion before we all head home. It has been suggested that we have book themed dinner parties. I can't see that happening some how. I find the whole thing very theraputic, it's good to talk! and books give the most beautiful forum for discussion.